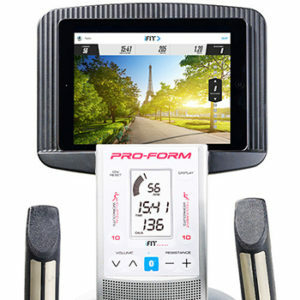 ProForm Hybrid Trainer Pro Review by Industry Experts! The ProForm Hybrid Trainer Pro is ON SALE! Elliptical Trainer & Recumbent Bike in One for a Bargain! Price Alert: This is $50 off the regular price! A nice little savings. The Hybrid Trainer series combines the benefits of an elliptical trainer with a recumbent bike. We were originally thrown off by the relatively low price of this combination machine. The original Hybrid Trainer can be purchased for less than $350. Now that we’ve had some time to get used to the idea, we feel this type of trainer is well worth the money. The line has been highly endorsed by celebrity TV trainers Heidi and Chris Powell of ABC’s Extreme Weight Loss TV show. This Hybrid Trainer Pro builds on the strong concept of the original machine and adds a stronger warranty, larger stride length and better durability. MID-WEEK SALE ENDS THURSDAY: The ProForm Hybrid Trainer Pro is reduced to $549 with Free Shipping! No Interest Financing is available.! The ProForm Hybrid Trainer is the #1 seller on ProForm.com because it allows consumers to purchase two machines in one for a very reasonable price. The Pro version has a slightly heavier flywheel, more programs, and larger stride length to enhance the workout. Both machines come iFit Coach Ready featuring workouts specially designed by Chris and Heidi Powell. There are some necessary compromises in design and specs that need to be made in order to reach a lower price point. These items will be discussed below. The ProForm Hybrid Trainer Pro has a 17″ elliptical stride, which is 2″ longer than the original Hybrid Trainer. An 18-20″ stride is more typical with a regular elliptical and allows for a more smooth circular stride pattern. You’ll be compromising this motion a bit with the Hybrid Trainer Pro. We like that you can adjust the pedals to an angle that is most comfortable. The flywheel on the Hybrid Trainer Pro is listed at 15 lbs (again 2 lbs heavier than the original model.) A heavier flywheel allows for a better and smoother elliptical motion. Again, remember that you are getting two machines in one AND a low price point. With that in mind, we think the lighter flywheel is okay. Finally, this is not a super heavy machine, which means it may have some stability issues with heavier users. The listed weight limit is 350 lbs, but I would put it at around 230 lbs instead. Just like the ProForm Hybrid Trainer, the Pro version works well as a recumbent bike. There are really no issues that concern us here. The ProForm Hybrid Trainer Pro is not for workout fanatics who expect health club quality machines in their home. Still, if you are a budget minded person who wants a great machine to help you get in shape, then this is perfect. It is basically two machines in one and allows you to get a great cardio workout (sitting in the bike position) or workout your entire body using the elliptical mode. You can burn calories and exercise various muscles groups. This machine will cost you about twice as much as the original Hybrid Trainer, but you are getting a slightly heavier flywheel, longer stride length and more program options. If you are a taller person, then you would definitely prefer this model over the smaller version. This line is wildly popular with consumers and has the seal of approval from Chris and Heidi Powell, so we feel confident in giving it our thumbs up as well! 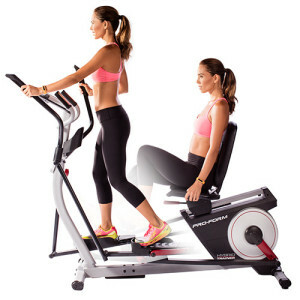 Click here for a comparison chart of all ProForm Ellipticals.